Little Baby Company is easily one of my favourite online shops. I might even be guilty of staking out their new products section more than is strictly healthy. My obsession is rewarded with a veritable smorgasbord of delicious new products. Their new outdoors fun section is jam packed with both kitsch and chic products for the garden, beach and picnics including a Bambino favourite Anorak. They have new products on from Ferm Living including the Little Darling Marionette Organic Cushions I fell in love with earlier this year and the plumptious knitted poufs (pictured bottom left). 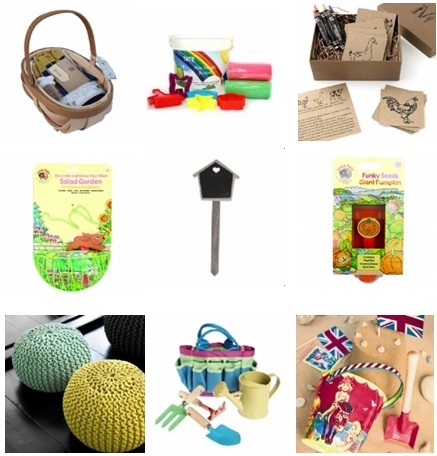 For those of us who have been gazing enviously across the pond at the inspiring Moomah, a creative space for children and their caregivers to connect, there are a few of their beautiful products. From the do-it-together memory game (pictured top right) which can be coloured by the child to the stickers which encourage children to explore their surroundings each of the products inspires creativity and discovery. Just in case this summer doesn’t turn out to be the long days of sun we have been promised the brightly coloured TATE play dough bucket (pictured top centre) is a must have to whip out when the clouds gather. It is also worth stopping by their sale section as there are plenty of bargains to be had! Yet again Little Baby Company have come up trumps and chosen a range of products so tempting you may well want one of everything.